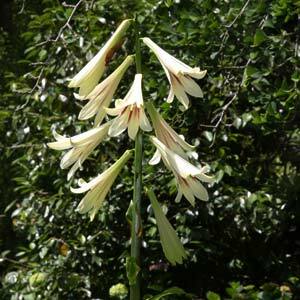 Commonly called the Giant Himalayan Lily, Cardiocrinum giganteum is from the lillaceae family and is the tallest growing of any lily. Spectacular flowers on a single tall stem, this is also one of the most impressive flowers for any garden. It has been in cultivation for well over 100 years, and is a plant that like a humus rich moist soil. It grows best in dappled shade, it will not survive in full sun, and for use grows well beneath a large Copper Beech tree near the drip-line. Flowering time will vary depending on the climate, the warmer the climate, the earlier it will flower. We grew ours from seed given to us by Mrs Tindale, of Tindale gardens in the Dandenong ranges. Requiring shade and moisture (and patience) Cardiocrinum giganteum take about 9 years from seed to flowering size. However we do think that a 3m high lily with great drooping flowers on a huge stem, its worth the wait, and will certainly be a talking point. Of course you could just buy an advanced Cardiocrinum giganteum bulb and not wait so long. And yes they do put out offsets which can be carefully divided during dormancy, best after flowering when the main flowering stem of the bulb dies. If you are going to divide these wonderful plants be aware that they do resent being moved. The best time to divide if you must is after the main bulb has flowered. Wait until it dies back and them divide the offsets. These are also a hungry plant, well rotted compost, leaf mould and a slow release organic fertiliser will assist with growth. Good companion plants include Rhododendons, Trilliums, Astilbes and Dicentra.